Photographic evidence of damage to dunes from recent tide and storm surges along Cottesloe beach are very worrying to say the least. 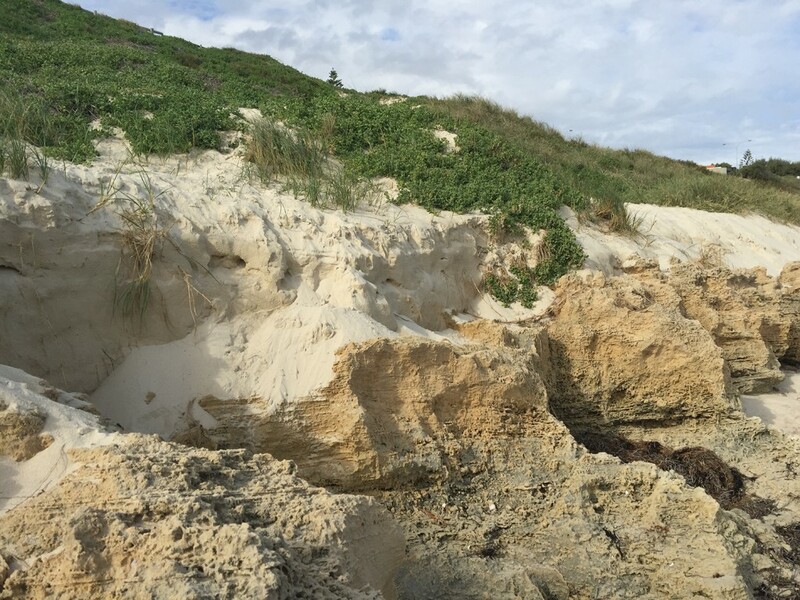 Tides and storms have produced damage to dunes that have never been touched before and vegetation that was on top of dunes for thousands of years is now hanging on the edges of small cliffs caused by the storm tides. The sand has also been sucked out of some dunes leaving bare rocks in its place. Recent storm surges have sucked out the sand from the Cottesloe dunes leaving only rocks behind. This phenomenon was predicted back in 2010 by architect and environmental scientist, Garry Baverstock and he feels it will require a re-think to the planning schemes along the ocean front for houses and developments. The damage due to tidal and storm damage is speeding up considerably and enough space needs to be left for beach dunes to move Eastwards and they could very well move to the East by around 30-70 metres by the end of the century if we have a one metre ocean rise. This rise will continue until the ocean stabilises to a new level due to carbon levels in the atmosphere. The photos show that we already have seaweed up to the end of the sand dunes and made ingress in places where the dunes have been out another 2-3 metres. A recent planning scheme around 2012 had a suggested height limit of five metres along Marine Parade. At this time the economics doesn’t support building 5 storey units as the blocks are too small. The street alignment really needs to move back to allow the dunes to naturally re-establish a new beach in the next 8 years to rejuvenate the dunes. Allowances need to be made for the traffic along the waterfront during the re-juvination process and solutions to handle the traffic flow devised, whether it be tunnels or other methods to get major traffic away from the ocean edge. If this planning process does not materialise, Cottesloe could face the prospect of having to build massive retaining seawalls like the 7 metre seawalls found in some cities like Cadiz in Spain. Cottesloe could go the same way by the end of the century if we don’t plan for the ocean to ingress naturally. We could be faced with the prospect of pumping sand from a sea channel similar to what we see on the Gold Coast of Australia. Solutions such as these may work for 30-50 years but if the ocean rises by I metre or higher; it will take out the sand and it will ingress further. The iconic Cottesloe beachfront could be no more as well threating the immediate real estate along the coastal strip. In the East coast of Sydney, storms and tidal surge events have taken out 8 metres of sand and are threatening a lot of seafront houses and back yards. In 30 years it threatened and wiped out the back yards and now the threat has extended to eliminating the houses themselves. For every 100 mm of sea rise on sandy beaches, there will be a loss of about 10 metres of beach lost forever due to the tides and storms. The photographic evidence is now clear that the next planning scheme needs to address this issue before the iconic views and amenities of Cottesloe beach will be lost to all. 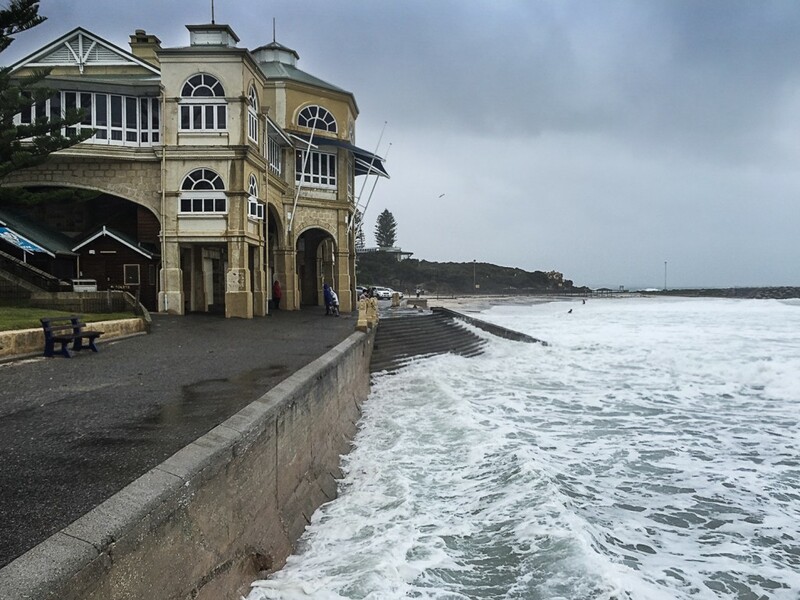 Sea erosion and overshadowing of the beach will be the fate of Cottesloe beach if the Town of Cottesloe proceeds with Local Planning Scheme 3(LPS3), according to environmental scientist and architect Garry Baverstock. Under LPS3, buildings fronting Marine Parade will be restricted to three storeys and buildings five storeys and higher need to be set back at least 10 metres. “Currently LPS3 needs to be rejected and a new plan that addresses rising ocean levels, the degradation of sand dunes and a change of character of Marine Pde needs to be done,” Mr Baverstock said. He suggests the Marine Pde alignment to be moved back towards the east by 20 to 30 metres. This is to allow the beach to move eastwards as sea levels rise and consequently erodes the coast. Sea level expert Dr John Church agreed and said sea level rise affects foreshore development in two ways. “One is the increase in flooding of coastal or low lying areas and the second is impact on coastal erosion,” said Dr Church. Coastal erosion is mediated by surface waves but rising sea levels allow those waves to reach further inland. Mr Baverstock said sea walls will need to be built if steps are not taken to ensure the primary sand dunes can move in an easterly direction for at least 30 metres. Reducing the overshadowing of Cottesloe foreshore is another reason for the 30 metre set back. The recreational use of beaches relies on direct morning sunlight so new, higher, developments located right across the beach will severely compromise beach amenities.